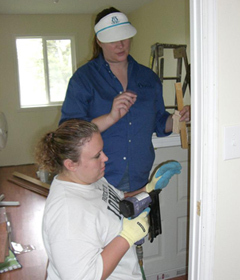 Two Des Moines church members install a door frame at a home near Biloxi, MS, that was damaged in Hurricane Katrina. On this national holiday, Iowa volunteers will mentor elementary schoolers, launch food drives and drive the elderly to doctor’s appointments and to get groceries. Hundreds of volunteers are still needed to sign up for a range of opportunities statewide to honor the Martin Luther King Junior holiday. Isaac Newton Farris, president and CEO of the King Center in Atlanta and King’s nephew, says the spirit of volunteerism is continuing to touch lives in Iowa and nationwide. “It is truly the proper way to honor the man and the legacy because that was at the core of his philosophy and message,” Farris says. He says many volunteers continue coming back for more because they feel they’re getting more out of the process than the people they’re helping. Farris says the economic downturn has Americans struggling and in need of many social services that volunteers can provide. “This has probably been the most challenging period since the inception of the King holiday — this is the 25th year of it,” Farris says. “I think there’s a genuine desire for people to take the opportunity to try and ease some of the pain and suffering that are out there.” For Iowans who want to learn more about how they can volunteer on the MLK holiday or anytime during the year, visit: www.serve.gov.